The residences at 909 Flats brings luxury Studio, One and Two-Bedroom apartments to Nashville. Situated near Bicentennial Capitol Mall Park at the nexus of Downtown Nashville and historic Germantown, 909 Flats is a short distance from Music Row, Vanderbilt University, and the Nashville Riverfront. 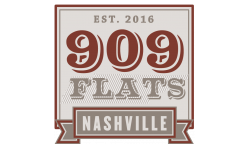 The ultimate location for professionals, emerging artists, and urbanites, 909 Flats provides residents with classic Nashville style in an eco-friendly setting. Highlighting the environmentally conscious changes to the Nashville Riverfront and surrounding green areas, 909 Flats offers Energy Star®-rated appliances, access to public transportation, and design elements that feature natural materials. Modern, and thoughtfully designed finishes and amenities, combined with a centralized location and professional management, make 909 Flats the ideal place for your new home.